Limitless Mod Co. has already shown you that the vaping possibilities were endless with their Hextron Sub Ohm Tank, now they’ve kept the momentum going with the release of their replacement coils. Measuring 0.5ohm, these coils are all you need to keep calm and vape on with your LMC Hextron Sub Ohm tank. 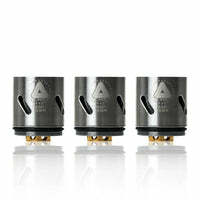 3 x Hextron Replacement Coils by Limitless Mod Co.
Hextron Replacement Coils (3 Pack) – Limitless Mod Co. has a rating of 5.0 stars based on 2 reviews.